Experience a harmonious balance between conventional cruising and private yachting, along with an exciting voyage of discovery, unravelling the wonders of the Ionian and of the Adriatic Sea. 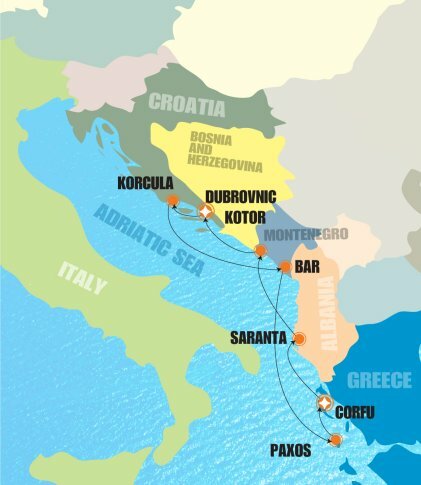 Discover the natural and historical treasures of the Ionian, of Croatia, Albania and Montenegro. Each day you will discover a new port of call, a hidden cove with crystal blue waters to cool you, a glimpse of ancient history to amaze you and rich cultural diversity to intrigue you. 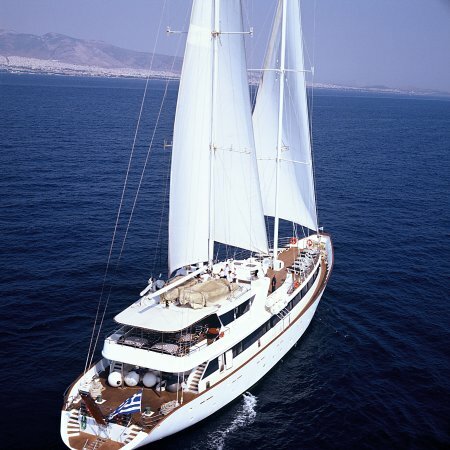 The M/S PANORAMA is a meter/24 cabin elegant motor sailer accommodating just 49 passengers in 24 outside cabins. The M/S PANORAMA is a 54 meter/24 cabin elegant motor sailer that was launched in 1993 and was renovated in 2001, 2008 and 2014. This state of the art sail cruiser has performed several Atlantic Ocean crossings, has sailed from the Seychelles to Monte Carlo and from the Black Sea to Cuba and offers the highest standard of accommodation, comfort and safety. The vessel complies with the most stringent SOLAS safety regulations. Embarkation betweem 3 pm and 4 pm. Welcome dinner - Overnight in port. Short stop in Corfu for clearance and continue to Paxos. Sail into a nearby bay for a refreshing swim stop and a BBQ lunch on board. This afternoon arrive in the unique port of Paxos. Overnight in port. Early morning sailing to Corfu, the Grand Lady of the Ionian Islands and the greenest island in Greece. All day optional excursions to explore Corfu's imperial past, the impressive historic centre declared UNESCO World Heritage site and the byzantine churches, or to take a scenic tour through the lush Corfiot countryside and old high hill villages. Overnight in port. Early morning sailing to the charming town of Saranda, boasting the most attractive waterfront on the Albanian Riviera. Join the optional excursion to the nearby archaeological site of Butrint. Afternoon sailing to Kotor, Montenegro. Overnight at sea. -- Full-board: Buffet breakfast and two meals daily, including a Welcome Cocktail, a local themed Evening, fun BBQ, weather permitting) and Captain's Dinner.